Ever wondered where the ice cream we happily slurp came from? While the exact origin is unknown, history traces the arrival of ice cream in Europe and then America by the way of Arab invasion of Sicily in the 8th century. It is believed that Arabs who had conquered Persian Empire at the time took the age-old Persian refreshment called Sharbat and enriched the existing mix of fruit syrup and snow chilled honey with milk and sugar. This was the conception of the modern day granita and gelato. Persia, that is modern-day Iran has been making ice cream for the last 2,000 years. Yakchal, a cone-shaped structure in the country is believed to be the inspiration for the design of ice cream. The underground space of the building was used for storing ice cream around 400 BC as the heat-resistant material of the structure helped preserve it. Iranians used to and still relish an ice cream dessert called faloodeh that is made ofstarch and syrup with ice. In the past, ice was stored in big bowls and milk in smaller ones and by rotational motions, the cold was transferred from ice to milk. This process helped the milk turn into crystals and then, finally, into ice cream. It is believed that this process then travelled to Itlay, who made machines to make ice cream making easier. A traditional Iranian ice cream contains sheep’s milk, sugar, saffron and rose water. If you are feeling ambitious and want to try your own version of Iranian ice cream, here are a few recipes. * Add the heavy cream in a bowl and blend it till it thickens. Then, add condensed milk to it. * Mix well and add one tbsp of rose water. * Dissolve 1/4 tsp of saffron in one tbsp hot water and add to the mix. * Add the chopped pistachios to the bowl and mix well. * Transfer the mix to a bread loaf baking pan, cover with plastic wrap and freeze overnight. * Garnish with rose petals the next day and serve. * Mix sugar in a bowl and add one cup drinking water to it. * Dissolve the mixture on heat and add 1/4 cup of rose water. 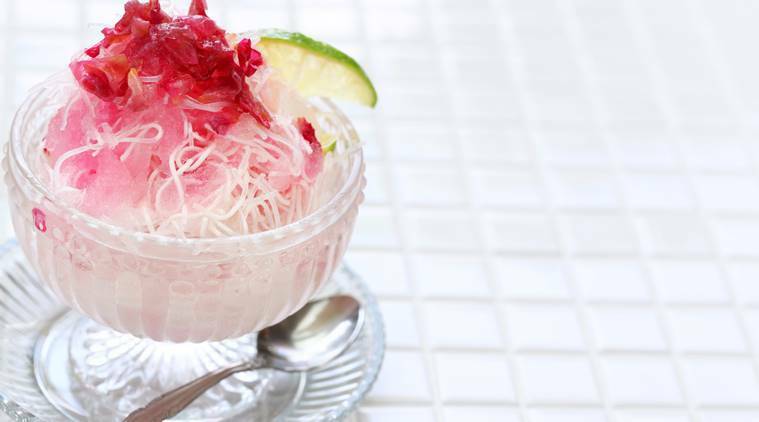 * To make faloodeh, take rice noodles in a pan and add boiling water to them. Simmer the mixture on a flame for five to ten minutes. * Drain the noodles. Take out the frozen sugar mixture and mix it with the noodles. * Store in the freezer again. When you take it out, squeeze one lemon on top of it and serve.